This basic chicken and noodles recipe is delicious by itself or served with a side of cornbread. 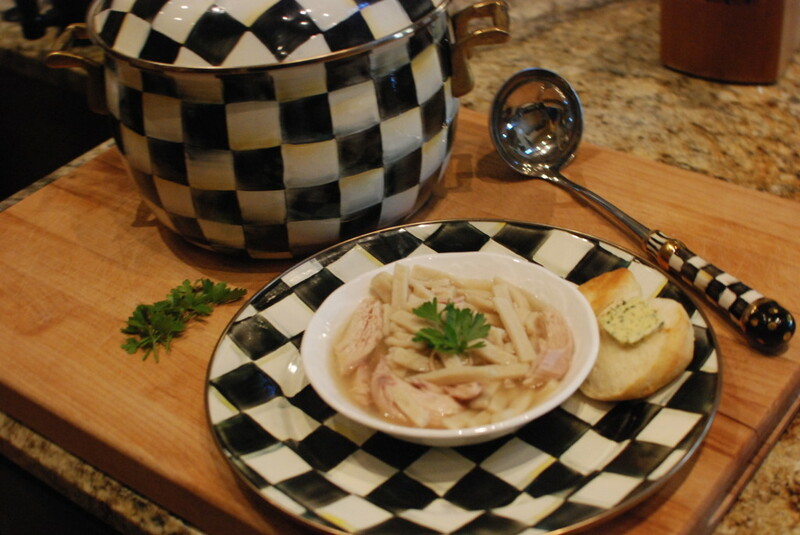 It can also be the base for Chicken Noodle Soup, or you can serve with biscuits or dumplings. This dish can please the pickiest eater and cure what ails you or makes a great “get well soon” delivery to a friend. In a heavy stockpot heat the oil on medium heat lightly sautéing garlic and onion until translucent. Add Chicken Stock, 2 cups Water and Raw Chicken, carrot, celery, celery salt, kosher salt and pepper. Be careful with the pepper - a little goes a long way. Stock and Water should be at least halfway up chicken, but no more than ¾.
Cook at Medium heat until boiling, then on simmer for one hour or until chicken falls from bone. While chicken is cooking, make noodles. If you are pressed for time Reame’s Egg Noodles are an excellent substitute*. Once chicken is fully cooked, turn off heat and remove chicken to platter or Pyrex. Remove skin and discard. If you cooked the giblets and parts in the pot remove and discard. Remove chicken from bone and put aside on separate plate until needed, discard carcass remembering to always make a positive wish on the wishbone! Using a small hand strainer, remove, carrot, celery, onion, bone, skin and fat pieces from broth. This results in concentrated broth. Add 2 cups water at a time until you have desired concentration. To taste but usually 4 cups. Once broth is clear, increase heat until stock boils. Add noodles a few at a time, stirring to prevent sticking, return to boil. Once boiling, approximately 5 minutes, reduce heat to low and simmer for 20-25 minutes or until noodles are done throughout. Add chicken and stir to reheat fully, 5 min. This recipe is very basic. Most recipes add ¼ -1/2 tsp. salt, but for use in chicken and noodles do not add salt or dish could be too salty. Add Flour until you get the consistency to roll out 2-2 1/2 cups. Cut into strips in desired thickness, air dry for a few minutes. 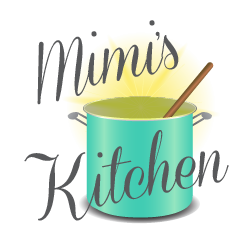 Mimi makes a mixture of one teaspoon celery salt, one teaspoon kosher salt and ¼ teaspoon fresh ground black pepper to pinch over the top of each bowl. *2 12-oz. bags Reames Homestyle Egg Noodles. Note: Reames also makes Gluten Free and Yolk-Free if desired).